Here is an update with what has been going on the past few months at our practice. Also, follow us on Facebook for articles, fun facts, and updates about the practice. The 2017 American Dental Association meeting was in Atlanta this year! There were lots of great exhibits, new products, and continuing education while at the meeting. Peyton Manning was the distinguished speaker so we were sure to wear our orange in support! Also in October, Dr. Walker and her family participated in the Alzheimer's Association's Alzheimer's Walk at the Knoxville Zoo. The family walks in memory of Dr. Walker's grandmother, Mary Ellen, every year. This May Dr. Cox and Dr. Walker attended the Tennessee Dental Association Meeting in Gatlinburg, TN. This year was the 150th Anniversary of the dental meeting so we were glad to celebrating so close in Gatlinburg! We saw several new and exciting products at the exhibits and were able to meet up with dental friends from all over the state. In September 2016, we celebrated Brenda's retirement after 19 years of hard work as our receptionist! A big thank you to all our patients that celebrated with us and we wish Mrs. Brenda the best as she starts this new adventure! Fall is always a busy time for us with Continuing Education courses! We have attended several already this fall including courses on composite restorations with new esthetic techniques, full arch implant restorations, orthognathic surgery, and immediate load single implants. These pictures are from a 3M Style Italiano Course taught by Dr. Marcos Vargas. We were the first class in the United States to receive this presentation. We were learning advanced composite resin shading techniques. September 2016, Drs. Cox and Walker traveled to Carlsbad, CA to attend a 2 day course on dental implants at the Zimmer Institute. 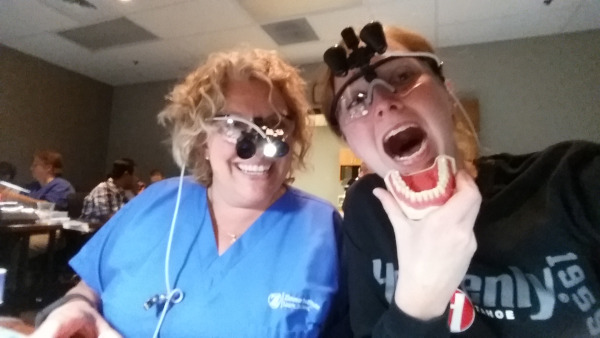 We learned how to restore an edentulous mouth with fixed, non-removable restorations using dental implants and how to fabricate single implant provisionals. Our course also included a factory tour and hands-on lab so we could make the restorations as we learned. Drs. Cox and Walker both received the ACE Award Certificate for 2013/2014 recording period from the TDA Council on Scientific Programs and Continuing Education. This award is in recognition of doctors who complete more than twice the required continuing education. 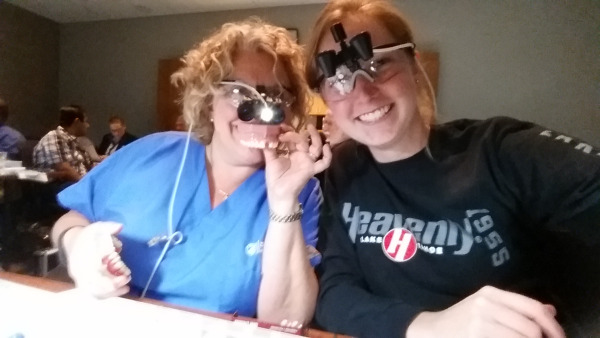 Our office has invested in digital radiologic technology! As of Janurary 2013, all of our radiographs will be taken using digital technology. This exciting news means many benefits for our patients. 1. Digital radiographs require much less radiation to expose which will lower lifetime exposure for our patients. In our training we were told that the amount is one tenth of the amount needed to take a film radiograph. 2. There is a much shorter wait to see if the exposure shows the needed information. This will speed up procedures like root canals and check-ups especially. 3. We are able to share with other authorized providers (by electronic means) the information on the films almost instantly. That means we can email your x-ray to a specialist if needed and with your insurance providers when required. 4. Your radiographs our now backed-up with the other data in our electronic chart so that in the event of an office tragedy (fire or flood) our data should be restorable. We weren't able to do that with the films! We know how much you all appreciate it when we invest in new technology to improve your care and experience.